Nearly 40 years after it all kicked off punk is still as influential as when it was first birthed into this world in the squats and disillusioned minds of the youth of the world. As much as I love punk I rarely listen to the first wave of punk that became synonymous with the London in the late 70s, so much so that rumour has it fresh faced youngsters were often stopped in the streets and asked to dress up like punks for tourist postcards. 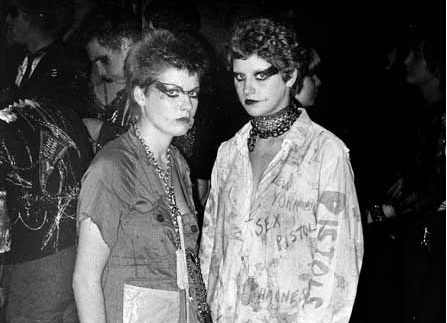 This edition of Mixtape Alert takes us through that first wave of 70s punk from the poppy energy of The Rezillos to proto riot grrrl call to arms of Sick Things. Listen, enjoy and for God’s sake don’t put egg whites in your hair after. p.s. PragVec aren’t on Spotify but listen to them anyway. Tags: action pact, au pairs, kleenex, mixtape, penetration, prag vec, punk, sick things, The adverts, the lewd, the rezillos, the slits, trash, x-ray spex. Bookmark the permalink. Don't Dance Her Down Boys is a blog run by one woman on a mission to share her love of female musicians and female fronted bands with the world.